The AutoStop® Brake Fluid Tester efficiently and accurately measures the moisture content in vehicle brake fluid. Brake fluid is designed to have a high boiling point to withstand the high temperatures generated by friction in the vehicle brake system. Unfortunately brake fluid readily absorbs moisture from air that transfers through the flexible rubber hoses. Moisture reduces its boiling point leading to possible brake failure. Overseas studies have highlighted that over 50% of vehicles on the road today may have fluid that is too old to be within safety standards. Just like oil, brake fluid wears out and then it is simply not as reliable as fresh new brake fluid. In addition moisture contaminated brake fluid can corrode internal engine parts. 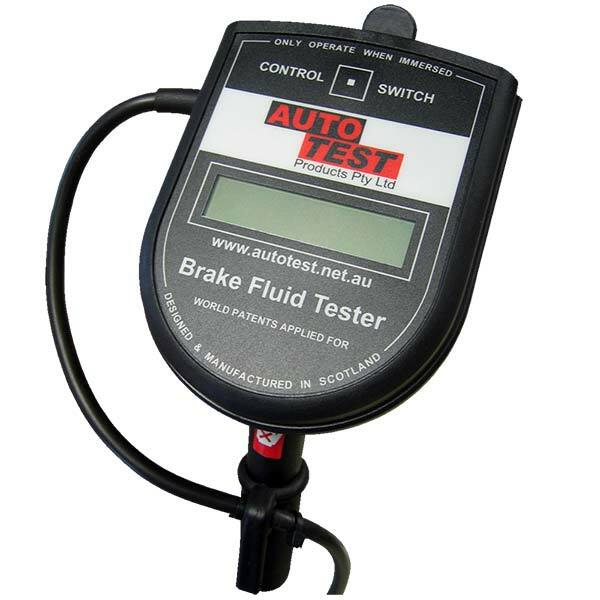 The AUTOSTOP™ Brake Fluid Tester measures the moisture content in vehicle brake fluid. It provides accurate results in less than one minute that allows dealers to identify vehicles that require a brake fluid change. Consequently it increases sales of brake fluid and brake fluid flushes. The AUTOSTOP™ Brake Fluid Tester also increases the value of quick lube inspections, seasonal brake checks and routine servicing. Enhance your reputation for customer care and protect your clients by providing a brake fluid safety check. It’s not age and mileage that determines brake fluid change intervals; it’s moisture absorption. Brake fluid gradually absorbs moisture form the air. Moisture enters through the flexible hoses & reservoir breather. Absorbed moisture reduces the boiling point of brake fluid. Under prolonged, hard braking conditions, particularly in hot weather or when a vehicle is heavily loaded, heat from the braking action can suddenly vaporize the fluid. Vapor, unlike liquid, is compressible, and the driver’s foot suddenly goes straight to the floor, resulting in complete loss of brakes, known as Vapor Lock. Click here for product software/firmware, manuals and brochures. © AutoTest Products Pty Ltd 2016.